1. Betty Boop and Felix. 2. Penny Singleton (sigh) who played Blondie in a long series of films. 3. According to insider lore, Rube Goldberg's editorial cartoons were ghosted by his assistant. 4. They offered to pay him a little extra to produce Wash Tubbs as a Sunday topper strip to Out Our Way. 5. The founders were V.V. McNitt and Charlie McAdam. Get it? 1. The original title was Mitzi McCoy, then it was Kevin the Bold. 2. Ernie, now known as Piranha Club. 3. Les Turner's Captain Easy. 4. Puffy the Pig. Don Flowers drew it first, the last to take it on was Mel Graff. 5. The Importance of Mr. Peewee. Demerits if you said Mutt & Jeff or A. Piker Clerk. 2. In order -- You Know Me Al, Ace Drummond, Hap Hopper, Phyllis and Fang, Scroogie. 3. The writer was Frank Martinek and the strip was Don Winslow. 4. Funnyman, and the character stopped appearing in his own strip. 5. Red Rose Studios has several features, all locally oriented -- Texas Lore, Pennsylvania Profiles and Flashbacks would all count. Royal Features was Mike Roy's syndicate to distribute Hoss Laffs. Corinthian Features was Jim Childress' syndicate name for his Conchy strip. 1. In order, The Katzenjammer Kids, Gasoline Alley, Reg'lar Fellers, Little Jimmy, Radio Patrol. 3. King News by Moses Koenigsberg. 4. The strip was Cosmic Cow and the show Too Close For Comfort. 5. Clare Briggs - the brand was Briggs, and the motto on each can "When a Feller Needs a Friend". 1. In order, Wally Falk, Mell Lazarus, Martin Branner, Stan Lynde, Ed Dodd. 2. The Heart of Juliet Jones. 3. The Chicago Inter-Ocean, the New York Recorder, and Charles Saalburg. By the way, the high-speed caveat is because newspapers prior to this sometimes inserted slick color pages into their papers for song sheets and such. These inserts were not produced on the newspaper presses, though, and the print job might take a week or more to run on a low-speed press. 5. Comrade Kitty (and I swear I am not making this up). What are the fabrications in Koenigsberg's book? A question I've wondered about for a long time: I read years ago about a member of the Hollywood Ten who found work after he was blacklisted by scripting a comic strip. I've never been able to find out who this was and the name of the strip. (mi sa che dovrò riparare a settembre). No I don't get it. The only thing that seems apparent is that both surnames and the company name all begin with Mc. Could someone explain? I agree with Double Naught, there is no 'in joke' to get. McAdam, who at one time worked for McClure, eventually joined McNitt to form McNaught. Last day of the super-quiz! How have you done? Here's a few really murderous ones to finish out. Mega bonus points for correct answers! 1. Cartoonists don't usually come out of the womb with a syndicate contract in hand. Here are some odd jobs that cartoonists claimed to have before they became successful in the toon profession. Which cartoonist was a bus driver (and proudly proclaimed so on his feature)? Who was a glass blower? Who was half of a husband-and-wife vaudeville dancing team? Who was a reporter for the Wall Street Journal? Who was a Yellowstone Park tour guide? 2. Margaret Mitchell of "Gone With The Wind" fame reportedly considered taking on the writing duties of what new strip of 1953? 3. Which American newspaper is responsible for the very first four-color printing on newsprint using a high speed newspaper press? Which newspaper was second? And which cartoonist was instrumental in inventing the new process? 4. A successful comic strip is bound to inspire imitators. Some take it too far, though. The success of Foxy Grandpa inspired a certain newspaper to bring out an imitation called ... Foxy Grandpa. Which newspaper was it that apparently never heard of the concept of plagiarism? 5. Socialism and fashionable clothing don't seem to mix. But mix they did in a fashion strip that ran in the Daily Worker. What was the title of the strip? 3-New York World + New York Journal American + R.F. Outcault? Thanks for the link - it appears the strip name was "Comrade Kitty"
1. Here are the titles of some Sunday topper strips; name the main strip they were paired with: Jungle Bedtime Stories, That Phoney Nickel, Zoolie, Li'l Ole Orvie, Public Enemies Through The Ages. 2. President Eisenhower had a favorite newspaper strip, one whose fortunes were flagging by the fifties. What strip got a major short in the arm when Eisenhower's preference was publicized? 3. Many of the fabricated factoids about comic strip history came from the memoirs of this syndicate head, including the reason the Yellow Kid was yellow. Who was it and what was the book? 4. A certain TV show starred a character who was the cartoonist on a comic strip about a bovine hero. What was the title of the strip and what was the TV show? 5. Lots of comic strip characters have marketing tie-ins. But which cartoonist was himself memorialized as a brand of tobacco? 4. The TV show was "Too Close For Comfort" (starring Ted Knight) and the character was Cosmic Cow. 1. A certain popular comic strip that ran from the 1960s to 80s starred characters who had a serious identity crisis. After living for the better part of two decades as mice, one fine Monday morning readers opened their papers to find the characters were now humans. What was the strip? 2. Famous people have lent their names, if not necessarily their writing talents, to quite a few features over the years. Name the features bylined by writer Ring Lardner, aviator Eddie Rickenbacker, political columnist Drew Pearson, comedienne Phyllis Diller and ballplayer Tug McGraw. 3. The writer of a long-running adventure strip moonlighted in the unlikely position of Standard Oil executive. Who was this captain of industry and what was his strip? 4. A famous comic book team created a newspaper feature in 1948 featuring a superhero whose secret identity was Larry Davis. What was the feature? For bonus points, what very odd change occurred in the strip after it had been running for eight months? 5. Many cartoonists who self-syndicate their work adopt company names to make editors think they have a 'real' syndicate. Among them are Red Rose Studios, Royal Features and Corinthian Features. Name the cartoonist behind each syndicate and the feature(s) each was self-syndicating. 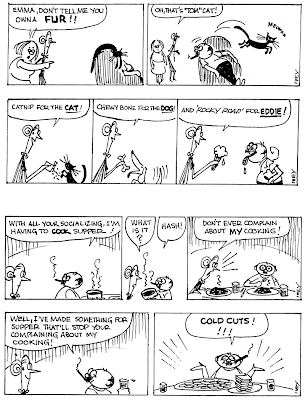 "[Frank V.]Martinek is creator of "Don Winslow of the Navy," daily strip. Cartooning is an avocation with Martinek, who is assistant vice-president of the Standard Oil Company of Indiana." Allan - I wanted to e-mail this link to you, but had my e-mail bounce back at me. It's video of the Chicago Tribune cartoonists of 1931 (Harold Gray, Frank King, etc.) which I edited out of a 1/2 hour silent promotional film called "Trees to Tribunes," which traces the story of newspaper production from the lumberjack to the newspaper boy. The highlight of this excerpt to me is Frank King with his brother-in-law, the original for "Walt Wallet." 1. Eek & Meek by Howie Schneider. And it ran until 2000. 5. Corinthian Features was the name used for Conchy's self-syndication. 1. A certain long-running strip finished up its quarter-century of syndication titled Up Anchor. What two other titles preceded that one on the strip? 2. A strip currently in syndication has the distinction of most likely being the only strip created by an atomic physicist. Who is it, and what are the two names that the feature has gone by over the years? 3. Which comic strip made headlines in the 40s when the story took on the subject of alcoholism? 4. Milton Caniff worked at the AP Syndicate before he hit the bigtime with Terry and the Pirates. Among the scut work he did at AP was illustrating a painfully awful little one-column feature starring an animal. What was the name of the feature? For bonus points, which well-known cartoonist originated the feature? And for even more bonus points, who was the well-known final cartoonist on the feature? 5. What is the title of the first sustained true daily newspaper comic strip? This should be a cakewalk for Hogan's Alley readers. 5. "The Importance of Mister Peewee"
1. Which two old-time animated cartoon characters were revived and paired up in a 1980s comic strip? 2. Humphrey Bogart's first movie kiss came from the luscious lips of which actress, and with which comic strip character was she closely identified? 3. In the 1960s the Pulitzer Prize for editorial cartooning started to be awarded for the sum of the cartoonist's work during the year. Before then, when it was always given for a specific cartoon, which famed cartoonist won the prize for a cartoon that was almost certainly ghosted by his assistant? 4. Wash Tubbs cartoonist Roy Crane felt it was time for his salary to be upped in 1927. When he asked the syndicate for a raise they said no. They did make him an offer that would boost his pay though. He took it. What was the offer? 5. The McNaught Syndicate was a major player in comic strips for over 60 years, but the name of the company was a bit of whimsy. Who were the two fellows who founded the syndicate and gave it the in-joke name? 2-Helen Heyes / Betty Boop?